Thank you to Lisa DeSantiago, from Double Take Decor, Hamilton, Montana for this inspiration and unique idea. 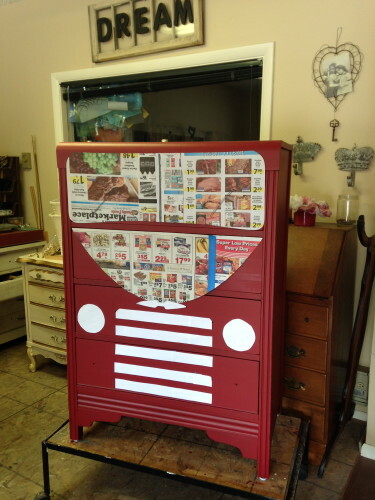 This is Lisa’s words on how to turn your dresser into a fire truck with fireworks red. 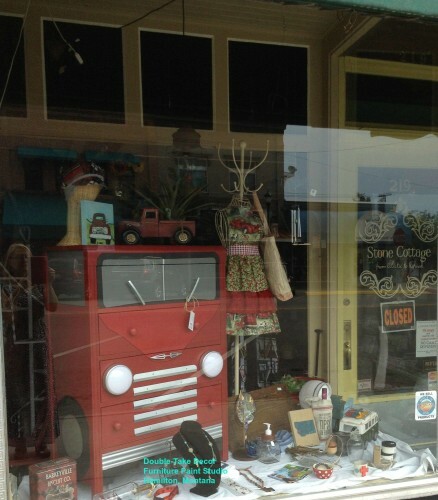 We were going to do a show called ‘Little Red Truck Vintage Market’ and got the idea it might be fun to ‘make one’. When we saw this ugly beat-up waterfall dresser with the rounded top, we knew we found the perfect one to transform into a cute ‘Little Red Truck’. Because we were so excited to start it, I forgot to take a before picture, but it was nothing special and pretty beat-up. 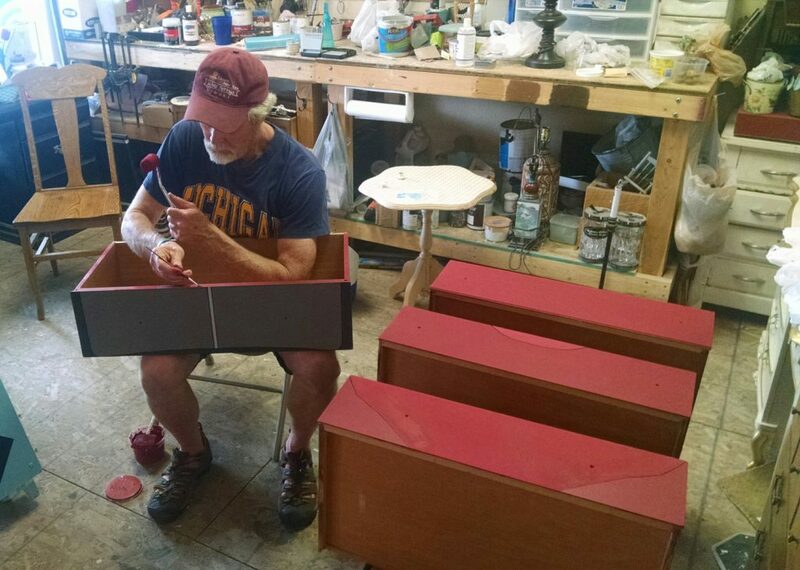 We began by painting the whole dresser red. 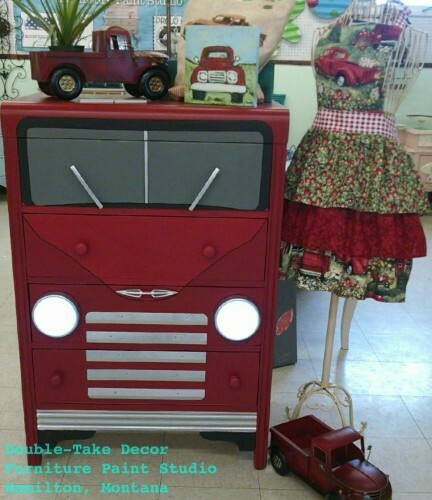 Then while looking back and forth at a pic of an old vintage truck, we tried to figure out how to make a dresser look like a truck. We had seen the VW bus dresser all over the Internet and loved them, but living in Montana, we thought a truck might be better suited here. So, together with our good friend, Tonya Opperman, we took the ‘visions’ from the picture, applied it to the dresser. First thing we did was paint the whole piece with APC’s Fireworks Red. Then cut the templates, making adjustments along the way. There was a lot of laughing, concentrating and ‘head scratching’ through out this step. Oh, and I think some wine was involved later in the evening. Then the penciling of the outlines began. Chip tried using a ‘paint pen’. But, it didn’t work very well in this situation so we had to outline the whole thing with a ‘sharpie’. HOLY COW was that nerve racking and time consuming. I was definitely out of practice with my coloring skills (kindergarten was a long time ago), because I did not do a good job of ‘staying in the lines’. Chip volunteered to REDO every outline to make precise and clean. And he didn’t grumble at all, thanks Chip! On to the grill-at first we were going to ‘paint’ them on but when I was at Ace looking for the ‘windshield wipers’. 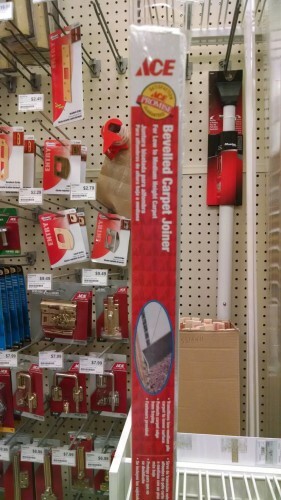 I walked passed the ‘metal floor transition’ section, you know the stuff you put on linoleum/to carpet when installing new flooring. I saw one that was beveled and was a smooth silver color; most have groves in them, and I had an ‘AH HA moment’ (don’t cha just love) So I bought one and thought I’d see if Chip could cut it to size. He said he could, and it would be pretty easy. He also rounded the top and bottoms to look a little like the grill in the picture. Now, each drawer needed a ‘handle’ so they were able to be used and the question then became “how were we going to make one into a ‘handle,’ what were we to do”? More head scratching and wine. As I was looking for something else in my ‘stash’ of stuff, I found an old brass handle that reminded me of a Chevy emblem and I had another ‘AH HA moment’ (I seriously LOVE those). 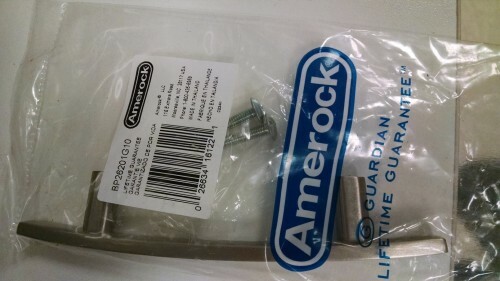 YAY, the drawer handle problem was solved! We didn’t have try and figure our how to make the ‘transition strips’ into a handle. 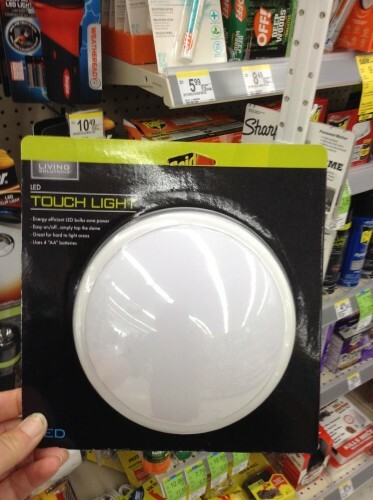 We had some ideas but didn’t have to ‘try them out’. I had a can of ‘silver metallic’ spray paint and purchased some ‘chrome’ oil base paint in a can. We sprayed painted the Top drawer Handles or ‘windshield wipers’, silver transition strips (grill) , the old brass ‘Chevy’ handle and the white ‘surround’ of the ‘headlights’. We used the ‘chrome paint’ on the bottom skirt for the bumper, the hubcaps on the sides and the ‘2 windshield’ separation piece. 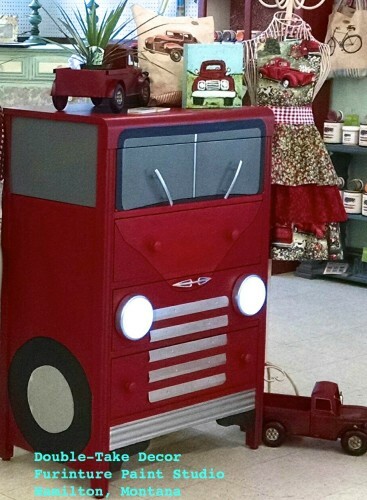 We love this little red truck dresser and we hope you do too! I like all the ways you used spray paint for the truck. My dad and I have an older truck we’ve been working on for the last year. I think we are to the point where we can consider what we want to do for paint. I think spray painting various parts for detail is a great option. I’m excited to see the finished result. Thanks for sharing! Please remember Logan we used out Fireworks Red brush on paint first to get that look. Not spray paint. Thanks again.